Many a beadmaker has attempted to make s hollow bead and found out, that the process is rather tricky and that the bead does not always turn out as expected. Good results require beside the right technique, practise, patience and a lot of experience. Larger hollow beads are extremely eye-catching; they are also light weight and easy to wear. They appear optically more delicate and sophisticated than solid beads. 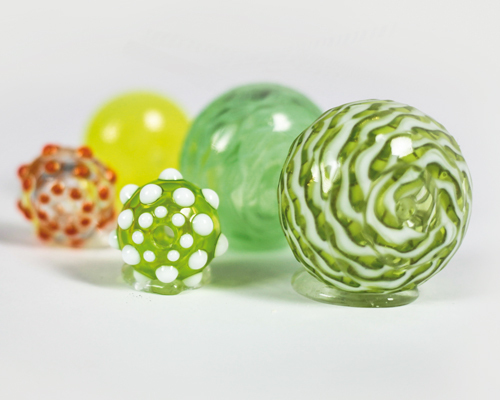 What type of glass is suited for hollow beads? How do you decorate a hollow bead? What about tensions and strength? How do you clean hollow beads inside? Hollow beads, big or small, filled with other materials or shaped beyond the round form – discover in this class the fascinating world of this challenging bead version. Skills: Experience at the 2-gas torch is required.